For cycling to be attractive, cycling infrastructure must be of high quality. Due to the high level of resources required to monitor cycling traffic locally, the cycling data available has often been patchy in the past. Currently, the most reliable numbers seem to be derived from permanently installed automatic cycling traffic counters, which are already used by many local authorities. One disadvantage of these is that the number of data collection points is generally far too low to cover the entirety of a city or municipality in a way that achieves truly meaningful results. The effect of side roads on cycling traffic is therefore not completely assessed. Furthermore, there is usually no data at all on other parameters, such as waiting times, route choices and cyclists’ speed. This gap might in future be filled by methods such as GPS route data, made possible by today’s widespread use of smartphones and the relevant tracking apps. The results of the project presented in this guide have been supported by the BMVI (German Federal Ministry of Transport and Digital Infrastructure) within the framework of its 2020 National Cycling Plan. 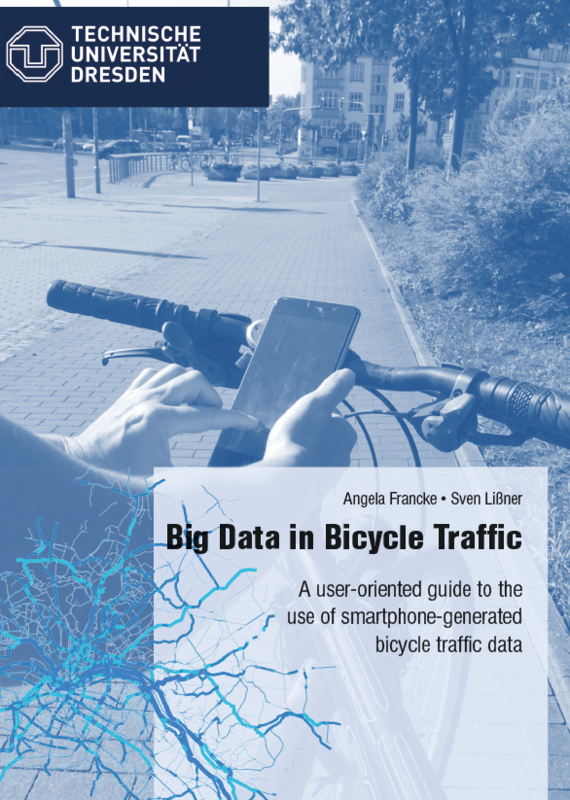 This research project seeks to investigate the usability of user data generated using a smartphone app for bicycle traffic planning by local authorities. In summary, it can be stated that, taking into account the factors described in this guide, GPS data are usable for bicycle traffic planning within certain limitations. Nowadays it is already possible to assess where, when and how cyclists are moving around across the entire network. The data generated by the smartphone app could be most useful to local authorities as a supplement to existing permanent traffic counters. However, there are a few aspects that need to be considered when evaluating and interpreting the data, such as the context of the routes surveyed in the examples examined (many are rather fitness-oriented). Moreover, some of the data is still provided as a database or as GIS files, although some online templates that are easier to use are being set up, and some can already be used in a basic initial form. This means that evaluation and interpretation still require specialist expertise as well as human resources. However, the need for these is expected to reduce in the future with the further development of web interfaces and supporting evaluation templates. For this to work, developers need to collaborate with local authorities to work out what parameters are needed as well as the most suitable formats. This research project took the approach of extrapolating cycling traffic volumes from random samples of GPS data over the whole network. This was also successfully verified in another municipality. Further research is still nevertheless required in the future, as well as adaptation to the needs of different localities. Evidence for the usability of GPS data in practice still needs to be acquired in the near future. The cities of Dresden, Leipzig and Mainz could be taken as examples for this, as they have all already taken their first steps in the use of GPS data in planning for and supporting cycling. These steps make sense in light of the increasing digitisation of traffic and transport and the growing amount of data available as a result – despite the limitations on these data to date – so that administrative bodies can start early in building up the appropriate skills among their staff.